Clubhouse 1 – This facility features a “rustic mountain” design, including a large stone fireplace that is a popular gathering spot for Bear Creek residents. Additionally, Clubhouse 1 has the largest pool in the community. Clubhouse 2 – The biggest of our three clubhouses, Clubhouse 2 is a hub for social interaction. It features lighted courts for playing tennis and pickleball, horseshoe pits, heated outdoor pool, Tiki Hut, kitchen, gift shop, and a banquet hall replete with dance floor and stage. Clubhouse 3 – Our newest clubhouse, this facility has a state-of-the-art fitness center, aerobics room, bocce ball courts, and a large, wraparound pool, among other excellent amenities. Residents of Bear Creek also have the advantage of living in close proximity to lots of nearby attractions. 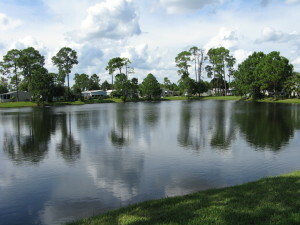 In addition to being only a couple of minutes away by car from mile upon mile of world-class beaches, Bear Creek is close to a municipal golf course, an assortment of gardens and parks, and of course the bustling community of Daytona Beach, which is just next door. For additional information about Bear Creek and the mobile homes for sale at our community in Ormond Beach, FL, contact our Lifestyle Team today.